Do you know what media training is? If you don’t, it’s when they teach people how to behave on television and radio. Media trainers work with politicians, business executives, and nowadays, a lot of chefs. Cooking on tv is much harder, because instead of just sitting there having a casual chat, you need to be fielding questions at the same time as measuring out and explaining fourteen different ingredients to the weatherman, who is calling you on your phone that’s vibrating in your back pocket, wondering where that darned spatula you thought your brought to the studio is, and how you’re going to fold egg whites without one. So here’s a recipe for Strawberry Rhubarb Jam, which combines two ingredients that I happen to adore. It’s very easy to make and economical; one big bunch of rhubarb and a big basket of berries and, well, you’ve got jam. 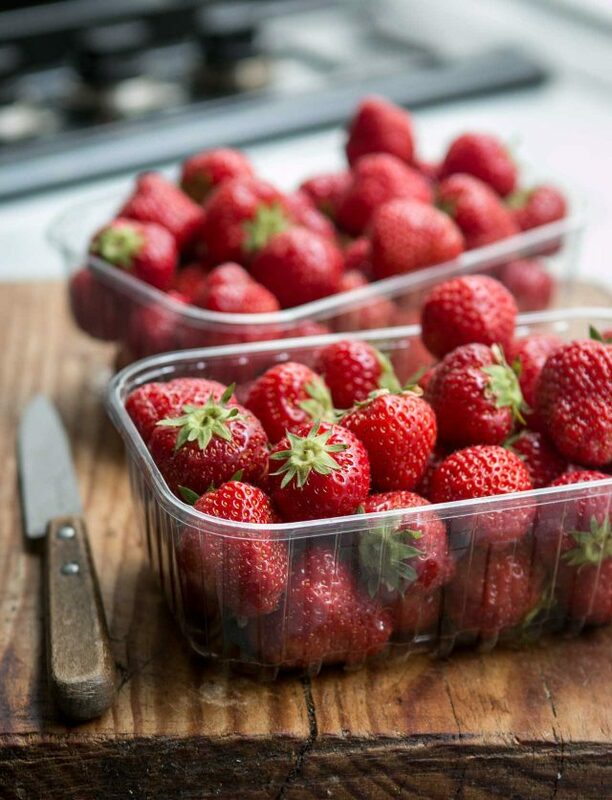 Although typically strawberries get paired with rhubarb, I think it’s often more interesting to add stronger-flavored and darker-colored berries, like raspberries or blackberries. And who knows? The bright red color might turn the tide for rhubarb-haters, and perhaps this jam can train them to do otherwise. Even though strawberries are the classic accompaniment with rhubarb, I occasionally mix in more assertive berries, like raspberries and blackberries. Frozen berries work in this jam just as well.Because rhubarb doesn’t have much pectin, and often add apple juice which helps the jam to set nicely. To do so, place a small spoonful of the jam on the frozen plate. Return it to the freezer and check it a few minutes later; if the jam wrinkles when nudged, it’s done. You can also use a candy thermometer; jam jells at approximately 220ºF (104ºC). Note: I don’t process most jams since I eat them within a few months and keep them in the refrigerator. If you wish to process them, check out Practical Canning Tips. I just made some blueberry jam and strawberry jam the other day. I like not using commercial pectin either. I just chop up some apples in my fruit. Thanks for this recipe! Your jam looks yummy! P.S. Small typo: “Even though strawberries are the classic accompaniment with strawberries” I assume you mean “strawberries are the classic accompaniment with rhubarbs”. Great timing. I was just writing a list of plants for the new garden, and you reminded me – must buy Rhubarb. When I was a kid a stick of raw rhubarb with the chewed off end dipped in sugar was a real treat. I am not so sure my more refines (!) palate could take the punishment now. We make a lot of rhubarb-raspberry and rhubarb-strawberry jam. Instead of commercial pectin we make our own, by boiling up apple peel and cores leftover from when we make apple pies and apple butter. It works a treat, because you don’t have to worry about cooking it too long (a problem with bought pectin) and it uses up our apple leavings. One thing that’s puzzling me. In this post and the white choc one you’ve referred to one cup jars being 125ml? Is that a uniquely French sizing for jars? I promise I’m not being a smart-arse, I’m genuinely puzzled! Very funny, David. Excellent post. And the jam recipe looks great. I have a bunch of red raspberries still leftover from last year’s harvest, rhubarb in the fridge, and strawberries in the garden and out the whazoo. (My daughter asked me, “Mama, what’s a whazoo?”) I’m inspired. A question: What can I substitute for the kirsch? Mama JJ: Any liqueur will do, which I add because it brings out the flavor. Grand Marnier, rum, port, or pear Williams can be swapped out for the kirsch. Or since it’s optional, you can leave it out. Celia & Memoria: Oops, fixed ’em. Simon: I did that too, and tried it recently and it didn’t taste the same anymore. I don’t know why, but I’m happy to cook my rhubarb nowadays. Sam: I’ve kept my jams for at least a year in the refrigerator, but it’s impossible to give an exact date to how long it’s going to last. In general, if there’s no mold on it, it should be fine to eat. There’s something wrong with anybody who doesn’t like rhubarb. Maybe it was just eaten raw or something. Your rhubarb/berry jam would be the antidote for sure. I had to smile when I scrolled down my reader to your strawberry photo. I posted a strawberry tiramisu today and a similar strawberry photo to yours. I love rhubarb, but it took an internship at Chez Panisse to really get it. I was even able to turn my husband into a rhubarb lover with a crunch dough rhubarb tart. Delish! I totally agree about the pairing of rhubarb and dark berries. I once had some overripe and delicious blackberries and mixed them with some rhubarb and the resulting jam was one of the best jam I have made. I bet it would have tasted even better with some liquor. I never knew about media training, it makes sense, usually chefs swear a lot and that wouldn’t go well on tv, except if you Gordon obviously. You recount is very funny, I have to buy your latest book if it is written with the same wit. I forgot to ask….would the apple juice make the jam too sweet? I like jams to be less sweet than normal, should I cut down the amount of sugar? Imagine hating rhubarb! But it’s so PINK! I like the idea of adding apple juice (and someone’s suggestion of using cores & peels). I’ve never had something with store-bought pectin work out correctly, anyway. I recently made your cherry jam from a couple years ago and it turned out great. I made my first strawberry rhubarb pie a month or so ago and it failed miserably, The strawberries were too juicy and filling was so loose it just ran out of the consquently soggy pie shell. Determined not to waste all that fruit, I emptied the filling into a sauce pan, added some chopped dried appricots for color and pectin, and lots more sugar and made it into a jam. It was very good..a little tart, but I will try it again. Wish I’d thought of raspberries, I had those too. David – your timing is impeccable. Our CSA box this week has rhubarb and strawberries so I’ll be making this delicious jam soon. Just finished reading your book and loved it! It made me laugh and it made me hungry too. Those brownies are to die for. Having been the lucky recipient of a jar of David’s rhubarb-berry jam, I can personally attest to its deliciousness. Gazongas?! I hate gazongas! I once tasted it and…bleech!….it was the worse thing I ever put in my mouth. It was disgusting! God, I hate gazongas! haha, like this insightful and funny entry of yours! most of all, like your recipes! WHO doesn’t love rhubarb…I don’t know why people don’t like it, I think it is delicious…my partner won’t go near it no matter how hard I try to persuade him it’s nice…lemony and tangy and as sweet as you’d like it to be…I shall not win this battle I can tell but it doesn’t stop me trying! David…I was recently trolling through lots of rhubarb recipes and read in some of them that rhubarb has a lot of natural pectin, so I am now confused because I don’t doubt for one second that you know your stuff in this department and you say it doesn’t have a lot of pectin….. maybe that is why my attempt at rhubarb and mint jam turned out to be more of a candy with a caramel flavour than the joy I had hoped it would be?? Thanks for promoting rhubarb!! Laura: The small amount of natural sugar present in apple juice doesn’t make a different, so don’t worry. I’m afraid I’m one of those who makes awful faces at the thought of rhubarb. It’s not the taste, so much as the texture – and I don’t enjoy having furry teeth afterwards! But I do love home-made jam. Here, it’s normally rhubarb-and-ginger jam, the two apparently going together very well (I wouldn’t know, that being one kind I don’t make!). I have never tried rhubarb, so no faces here. This sounds really good though. Homemade jam is the best. Barbra: Well, if you are indeed moving here, then you should sort papers. It’s an invaluable skill to cultivate, and one you’ll make good use of after your arrival. Boo hoo! Can’t get rhubarb here in Spain and the tinned stuff is awful! It looks so nice too and would be great on my home made scones…. It is a true savory use for rhubarb and that has a wonderful subtle flavor that reminds me of lemon and artichokes. Next I think I will try this jam. p.s. my jams usually last a year or more in the fridge, although a low sugar jam will only last a few weeks. I remember the duck…don’t drop him whatever you do! Ok, I said to myself that I would stop buying rhubarb every time I go to the market – I mean really now, move on. I have already made over a dozen recipes in the past few weeks. I have eaten way too many rhubarb roll-ups, and still have 5 mason jars left in my fridge of jam that I made — any guesses what kind? Rhubarb-raspberry-strawberry. The classic combo with my favorite – raspberries – in it too. Well, despite all that, looks like I’ll be trying your recipe after my visit to the market Tuesday morning. My justification – I never tried using apple juice! Enough reason right? I love rhubarb. But I generally like leaving it plain without other berries, like the other day I made rhubarb ice cream and it was sooo good! I have yet to make jam but I think I might give this one a try. And thanks Celia for the tip about using peels and cores of apples. I usually have lots of those left over from dehydrating apples slices and hate wasting anything that can be used somewhere else! What a great story! And I was quite amused to see this recipe, since I also made rhubarb jam today (with apricots, not berries, though). Maryann, we usually make pectin in large quantities from our apple leftovers, then bottle it and preserve it to use for the rest of the year. There’s a photo-tute on my blog about it if you’re interested, in the Jam section. Congratulations for being mentioned in the June 12th issue of Entertainment Weekly! Your blog was mentioned in the “Summer Sites” article. The strawberries look absolutely gorgeous. I tried making rhubarb-strawberry jam once, and i think i miss measured the water. The rhubarb I got was not really red, it’s kinda green which looks icky. Anyway, rhubarb is not something asian is familiar with. it’s a totally new thing for me! I think i’ll give this jam another try! Great post, very funny, and such gorgeous strawberries. The best part of local AM US news shows is the cooking demo segments near the end of the day’s broadcast. The anchor or weather girl who is assigned to assist is always so clueless and awkward. I wonder if some of these TV personality people have ever even made a bowl of cold cereal. Maybe I just like seeing people screw up worse in the kitchen than me? I’ve always enjoyed it for the comedic factor, now though I feel bad for all the chefs, cooks, and authors trying so hard to make a 45 min. dish in 2.5 minutes attached to a moron impeding their work and sales efforts. I’ll try not to laugh so hard next time. Because I was focusing to hard on the obnoxious rhubarb hater than the cook trying to promote their new book or restaurant. And in the end, I am truly more interested in the cook! Well, I am yet another who has not had rhubarb but this jam sounds great and my dad loves rhubarb. I was just thinking about jam today (raspberry) so why not try it! I made this today with rhubarb, strawberries and raspberries and some raspberry-apple cider I get at my farmers’ market. It turned out really beautifully. I first macerated the strawberries in about 1/2 cup of vanilla sugar, so I only added about five cups of sugar later. I am so grateful, that despite your recent promise to only talk about food on the blog, that you are not editing out what I like to call your “social commentary.” Rubarb is great and so is your blog. Thanks for so often making me smile while teaching me how little I know about baking. I finally harvested my rhubarb. I only have one plant, so I got about 2 cups after I diced it. 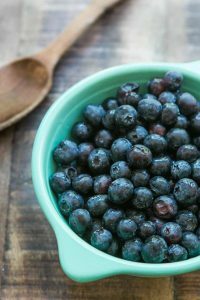 I tossed it in a pot with about a cup of dried blueberries and 1/2 cup of crystalized ginger. I added water and let it simmer for about an hour. So the question is…why can’t I taste the rhubarb? Did I harvest it too early? Did I cover it up with the other stuff? Thanks! Frances: Some rhubarb is pretty red, and other stalks are green. (You can see the difference.) I try to use the reddest rhubarb I can find for best results. 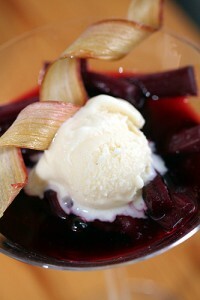 Erin: I’ve found that candied ginger has a way of masking the taste of rhubarb, and you’ve added quite a bit. So next time I would dial the amount down. Naomi: That’s a great idea, to macerate the strawberries in sugar in advance. It helps to augment the red color of the strawberries. Amanda: It is pretty funny won’t people don’t see. I did a tv show once, flying in the night before, and when I arrived, the woman who’d made my individual chocolate cakes had stacked them one on top of the other, for some reason. When I arrived, they looked like chocolate pancakes. I had to raid the vending machine for chocolate bars and try to remake them in the green room, using the microwave oven. But if you watch, a lot of those people don’t eat because they don’t want to have a mouthful of food. Oh my goodness! That Sam the Cooking Guy segment is so funny! I’m glad he let them have it, too bad he went back for the humiliation. I have audience issues with those cooking segments. I don t know how many times I’ve tried to hear what the Chef is saying only to have it interupted by the attempted humor of the show hosts. Gads..it drives me crazy, Even guest chef’s on Martha Stewart’s show have problems sometimes, she starts hogging the spotlight. I guess it’s the nature of the show beast..they all want center stage. Apple juice idea is great. No rhubarb here, so no hard feelings for the poor thing! Made a peach-rosemary jam 2 days ago & it didn’t set too well, so had to increase the peach content. It’s fine now, but next time apple juice might be the key! 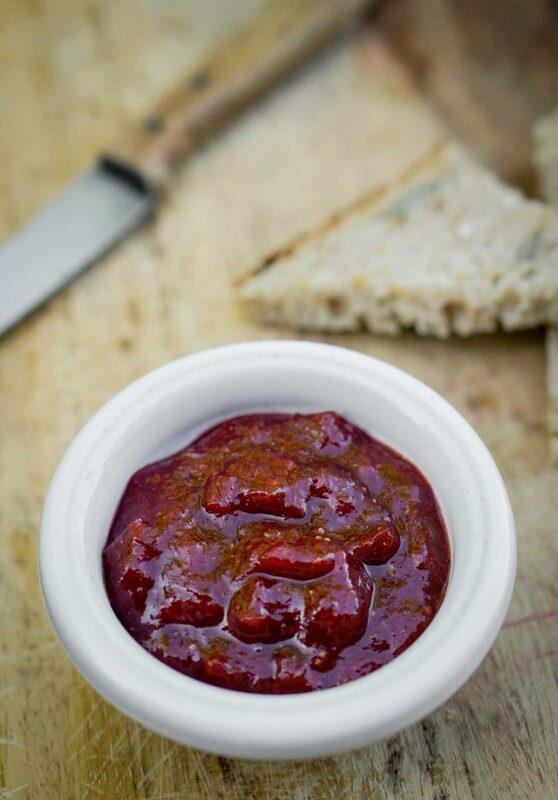 I have my eye on the cherry jam recipe…yum!! And oh, I think I’ll skip media training David…I’m learning quick off your experiences!! Rhubarb, in all its lovely manifestations, is so wonderful. Chop the rhubarb, dredge it in sugar, let it stand refrigerated overnight, and it will ooze some liquid. Then when you go to make jam, you won’t need to add any (or as much) liquid. Less water added to the fruit means less boiling time when you’re making the jam. For pectin, instead of apple, sometimes I’ll boil a whole lemon till soft, let it cool, chop it (careful, the insides may still be hot), remove the seeds, and add that to the jam-pot. Rhubarb-lemon jam made this way is delightfully zingy, although the colour isn’t as nice as David’s. Your jam looks soooo good. Ok, you’ve convinced me, I’m making this one. But only if I don’t have to process it. I’m pretty much a novice when it comes to jam-making. I was just wondering, why don’t you use commercial pectin? Thanks! 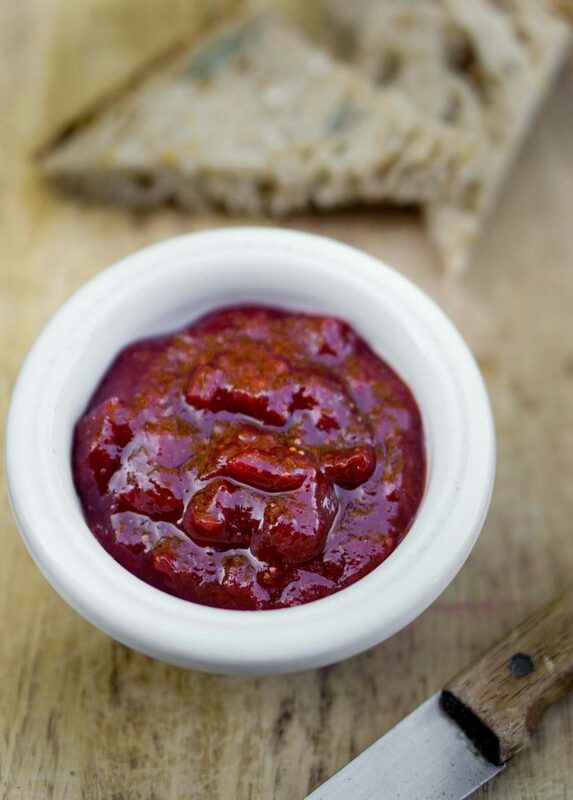 This is another Oz-emanation recipe,jam-making perfect for Sunday’s summer lunch. 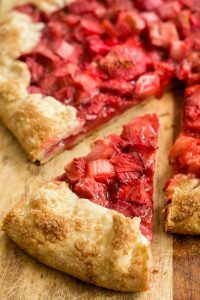 Love rhubarb and love the idea of making the classic pie combo of flavors into jam. Fantastic. Oh David, that was hysterical! The Sam the Cooking Guy segment was priceless. Kathie Lee is such a nightmare and attention hog. I would hate to have to work on anything with her, ughhh. Love the apple juice! Should try to make some at home. I made jam just like this last week when a neighbor dropped some rhubarb on my kitchen table. But I didn’t know about the apple juice — next time I will try that. I don’t like to use pectin, either, and I don’t put up jam. I make tiny quantities, and we eat it right away. Just wanted to say that I ordered ‘The Sweet Life’ from the US and finished it yesterday. I really enjoyed it and look forward to trying some of the recipes. I made your recipe for strawberry sorbet this evening–and I have to say, the addition of kirsch was totally ingenious! i can only imagine what kind of magic it works on a jar of rhubarb-berry jam. thank you!! Sarah & Susan: Oof! I felt sorry for him, but that’s what it’s like to be on morning television sometimes. Those hosts should know better, but as a guest, as I mentioned, you need to be ready to veer from the plan. Still, I think that was a regular gig for him so they should both have been more cordial. I was going a tv spot on the Today Show and Ms. Couric was fascinated with my cherry pitter. So instead of making the dessert, we had a cherry pitting contest. I forgot who won..although I’m pretty sure I did…I’m hard to beat! What a great post David! I love your site and tweets (always clever). I am a long time food/wine writer and expat in Santiago, Chile and at times, am shocked at how similar French mentality sounds to South America (a “latin” gene?). Definitely going to give this jam a try; we have copious amounts of rhubarb coming in from the Patagonia year round and I recently overdosed on it w/strawberry. Your cooking on TV flashbacks are hilarious and reminded me of when I cooked on Chile’s “Today Show” in front of millions…add Spanish to the equation too (uh, what language am I speaking?!). I thought I was going to die that day the ginger went flying across the room as I got too excited grating it. When in doubt though, always referring to “What would Julia do?! !” helped. I definitely think that cooking segments on TV look tough. The personalities that make it look easy are tremendously talented. Brilliant idea; although I confess that I’ve made similar jams myself. A little nitpicking: The measurements are off, surely? 1lb ~ 454g. Therefore, 1kg ~ 2lb plus a little bit. But certainly not 3lb, since that would be 1.362kg… Since it’s a jam recipe, it probably doesn’t matter too much, but I’d suspect that the metric version of this recipe would come out fairly non-sweet. I wouldn’t be allowed to cook on TV — my cooking contains Graphic Language. Especially when I can’t find the (*&%^%() potholder. Again. As you can tell by my email address, this recipe is right up my alley. Thanks! Here’s to dark berries and rhubarb! I was raised with my Minnesota grandmother’s blueberry-rhubarb pie and assumed that was standard… no one did it where I lived in west texas, but you can’t grow rhubarb there, either. When I finally went off to college in the big city and saw strawberry-rhubarb pie on a menu, I was _so_ excited by the novel combination… and then seriously nonplussed by the mild flavor. Strawberry pie is fine, but rhubarb deserves a bolder companion. I have a quick question: can icing/powdered sugar be substituted for regular granulated sugar in jam recipes? I have an excess and was thinking that putting up jam could be a good way to work through it. I loved your new book (just finished it last night)! Abbey: Glad you liked the book! : ) Usually powdered sugar has about 3% cornstarch or silicate added to keep it from getting lumpy. Technically, you could use it, but I find it has a slightly tinny taste, and generally don’t cook with it. if you do use it, you may wish to do the recipe by weight since it weighs a lot less than granulated sugar. Olga: If I posted a recipe for 1.362kg of something, I think there’d be a revolt. I revised it so it’s closer to the standard measurement, but do wish the world would pick one system or the other. Apolina: That’s a lovely idea, especially with cheese! Rhubarb is the only crop we have here in snowy (yes, snowy) Montana at present besides mint (pervasive – annoying, even) and ONE strawberry on the plants that mayh be taking their last breathe before a predicted evening frost. So, this, dear David, is PERFECT! THANKS! Did you see Obama? I hear rhubarb is his favorite. Loved the comments about media training! I’m a rhubarb hater, but I clicked through on your cherry jam recipe, which is very similar to the one I got from my grandmother. When I was a girl I would pick sour cherries off the tree in the back yard, then my mother, grandmother and aunts and I would sit around the kitchen table pitting them with hairpins so we could make preservers. Now I have one of those nifty German pitters that can do a pint in about a minute–much easier. Side note: returned from 2 weeks in Paris last night, and I have to say that I was quoting your book everywhere we went. You made me notice things I hadn’t before, even though we go about twice a year. Especially the fact that Parisians would rather bump right into you on the street rather than move out of your way. 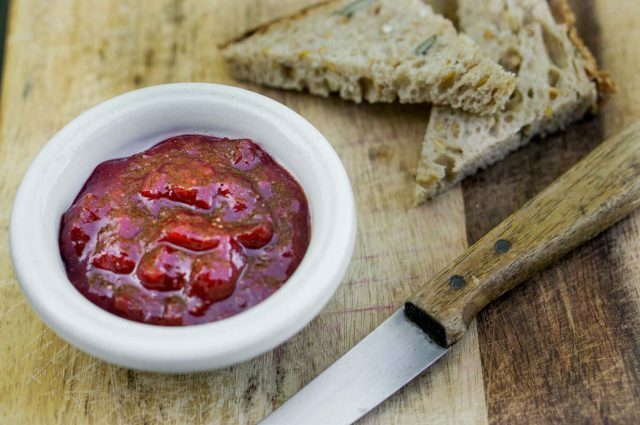 Ah… I do love seeing this rhubarb-berry jam, and it’s perfect because I was looking for a good recipe to try myself at home. Oh how I love rhubarb! I’ve never made jam before. Occasionally rhubarb makes it to the markets here. I have to try your recipe. Hurrah! I was just trolling the blogosphere for a recipe with which to use up some of the four pounds of strawberries I picked last weekend. And lo, here one of my favorite blogs is in tune with my needs. Thank you for the recipe and the humor. mmmmm very tasty…the strawberries…so beautiful! Amen to that! A recipe for 1.362kg would be fun, though. It’d probably call for 2/7 of a teaspoon of something else, too. Apple juice—I’ll have to give that a try. I want to make my own pectin but need to wait for some unripe apples. I read that currants are high in pectin so might give that a try too since they’ll be available before apples. Any advice or thoughts? Thanks. Jennifer: I love red currants but since they’re so strongly-flavored, you might want to use only half the amount for the berries I called for in the recipe, and if you want, use diced strawberries for the other half. Experiencing a major productivity slump: I made this jam yesterday and most of my brain power has since been dedicated to thinking of all the different ways I can eat it up. Thanks and curses all in one! I could only get my hands on .6kg of rhubarb and then used .5kg of strawberries. To compensate for the deviation, I used 3/4 c apple juice and 3 c. sugar and the jam still came together really nicely, despite my tricky math. Thanks for the info David. Can I just say how wonderful it is that you keep up with all your comments. And, I’m loving The Sweet Life in Paris. I’ve been reading it in morsels, here and there, not wanting it to end! Hi David, I just wanted to make sure that your eardrum had healed by now. One quick comment about your post…It is actually much easier doing cooking segments then doing a talking head interview. In a talking head interview it’s all you and nothing else. If you are not sustaining the entertainment on your own, the whole interview falls flat. If you’ve done your homework for a cooking segment, the food and cooking process will help you through the segment and remind you of the points you want to make. The food also brings lots of interest and entertainment to the segment segment. Hi Lou: Well, I must say, you prepared me for anything really well. Although I still never figured out a good, quick answer to what you call: “The one question that you don’t want to be asked.” Because, as you said, they’re sure to ask it. I made this a couple days ago with strawberries (I used apple juice) and it turned out very nicely (a little soft, but still very good). It made plenty and I’ve already given some away as a hostess gift- people are impressed and I assume it’s because nobody does these kinds of things. I think I’ll have to make more and put it away for the year- I have to be very careful about sharing… it may just be too good to give away! It’s awesome over vanilla ice cream! I have to say that I made your vin de peche the past two years. I cook for some Europeans once or twice a week and took a bottle this year as a special treat. I had to make more! Good thing I have a peach tree. P.S. I loved the book! mmm this reminds me of a recipe i make “Strawberry Rhubarb Ginger Jam”…. this sounds delicious!! Apple juice—I’ll have to give that a try. I want to make my own pectin but need to wait for some unripe apples. I read that currants are high in pectin so might give that a try too since they’ll be available before apples. Any advice or thoughts? Just made your recipe tonight – turned out great! Thanks for the tips! Great recipe! It turned out delicious. Thank you!